now I have a complete different problem since a couple of weeks. 1. Tha automatic levelling is not working propperly anmore. 2. I did pretty much all that was recommended in previous forums... Build plate issue, changed nozzeles, updated firmware etc.. nothing works. 4. can someone check the log-Files to see if the sensors themselves are defective? Is there some other issue to that? I would like to attach a video so that you can see what exactly is happening to the system. It also comes to a halt in the middle of the Z-axis, which before it didn´t do... is this supposed to be this way? Then it stops 2-3 cm befor it touches the nozzle (before it stopped ca. 1mm before the nozzle) and it does the ministeps but after a while it just aborts and goes back down telling me to check the nozzles or that the difference between them would be too high. But that is bogus because nothing changed and all the settings remained the samt. 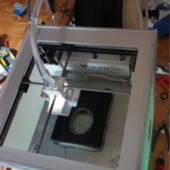 It came this way after I updated the firmare of the printer... ah and sometimes it works 1 time out of 15 tries but still the print is not working :-(. The only thing I can do right now is manual levelling but this is a p... ! Please someone from UM3, feel free to post something useful as I can not always do a manual levelling. Before this the prints were smooth and clean. now they are really hard to get them to stick to the bed propperly. I want the automatic levelling to work again. PS: Wanting to show the film I learned that you don´t allow .mp4. Why? Just converting the video did cost me 1 hour of time (onlinconverter) and quality is poor and the video, which was 50MB in .mp4 now has 225 MB in .GiF. I don´t get it... is there an easier way? The second thread was exactly, what I thought too, but the cables are attached to the board so this won´t be the problem either... only if the sensors have a defect. I have a capacitor-meter but I would need some advice on how to read them propperly (e.g. if the machine is runnig, or even doing a leveling test... in this case I would have to dismount them and test them but again this is a moving machine so I would need exact help to be able to execute this kind of a test.) Maybe someone of you already did it and can tell me which contacts to test and what the meter should read at each point. That would at least eliminate the problem of not knowing if the sensors would be defective.. Thanks for any further advice and have a good week. do you have any news regarding the fixing of the automatic levelling problem? I still don´t know what exactly is or could be wrong with the UM3... Can I take other steps to eliminate the printbed from stopping half way to the cores and then don´t even touching them? It is pretty sad that I can not use the printer anymore now for almost 3 weeks and there is no clue what I could do to search or narrow in the problem.. The auto leveling seems to have certain limitations that go out of whack the instant you touch any of the screws. There also seem to be several bugs in the manual leveling process. In order to successfully level my printer, I totally ignored the display and did my own thing, because so many of the prompts were unhelpful (and the lack of a "go back" or "cancel" option is totally frigging annoying with the U3s oops-I-dialed-when-you-clicked dial). Start by turning all of the screws to make sure they don't feel super loose - don't over-tighten them either. I changed mine from being so lose I could brush one finger tip past and turn them to where I don't need to grip them but I need a fingertip on both sides for them to turn. Next, run the manual level and for the "1mm away" step, use something like a credit card. I used an old one and made sure that the raised print fit under the nozzle. No accuracy is really required for this step but I found it helped if all 3 checks were about the same height. For the calibration card check: my leveling had resulted in the nozzle being so low that nothing came out. So, I replaced the calibration card with a thin sheet of card, about double+ the thickness of the calibration card. This had several advantages, not least being that its flat without requiring any pressure which might invalidate the calibration. When you do this, you're not looking to feel like the card is being caught on the nozzle. You should be sweeping the card/sheet back and forth and then adjusting until you can *just* barely tell that there might be contact with the card. I found this so hard to judge that what I actually did was reach the original point I considered "a little resistance" and then give the screw a 1/16th turn in the opposite direction, which put me at a place that ever-so barely felt a little different than moving the card away from the nozzle. Then I did a fairly simple test print of a single-layer circular face with a rectangular cut-out in the middle (15mm diameter, 8x5 rectangle). I still ultimately wound up making a couple tiny screw adjustments, but I also discovered that running an autolevel after this made things worse again, so I repeated the manual level and I've been getting great prints again. I'm about to apply GR5's tip on setting "Combing Mode" to "not in skin" in the hopes I stop getting horrible, messed up first/top layers.